Remember comets Lovejoy and C/2012 X1 LINEAR? We dropped in on them in late January. On Feb. 6 the two cruised within 2 degrees of each other as they tracked through Ophiuchus before dawn. Were it not for bad weather, astrophotographer Damian Peach would have been out to record the cometary conjunction, but this unique photo, taken two mornings later, shows the two comets chasing each other across the sky. Of course they’re not really following one another, nor are they related, but the illusion is wonderful. Comets Lovejoy and X1 LINEAR are neighbors in northern Ophiuchus through Feb. 25. This map shows the sky facing east about 1 hour 45 minutes before sunrise shortly before the start of morning twilight. Tick marks show the comets’ position every 5 days. Detailed map below. Created with Chris Marriott’s SkyMap software. Rarely do two relatively bright comets align so closely. Even more amazing was how much they looked alike. By good fortune I was able to see them both through a 15-inch (37-cm) under a very dark sky this morning. Although Lovejoy’s faint, approximately 20′ long tail was fanned out more than X1’s, both tails were faint, short and pointed to the west-northwest. Lovejoy’s coma was slightly larger and brighter, but both comets’ comas diplayed similarly compact, bright centers. Lovejoy currently hovers around magnitude 8.1, X1 LINEAR at 8.8 – less than a magnitude apart. If you haven’t seen them yet, they’re still the brightest comets we’ll have around for another few months unless an unexpected visitor enters the scene. After converging for weeks, the comets’ paths are now slowly diverging and separating. Look while you can; the waxing moon will soon rob these fuzzies of their fading glory when it enters the morning sky this coming Tuesday or Wednesday. 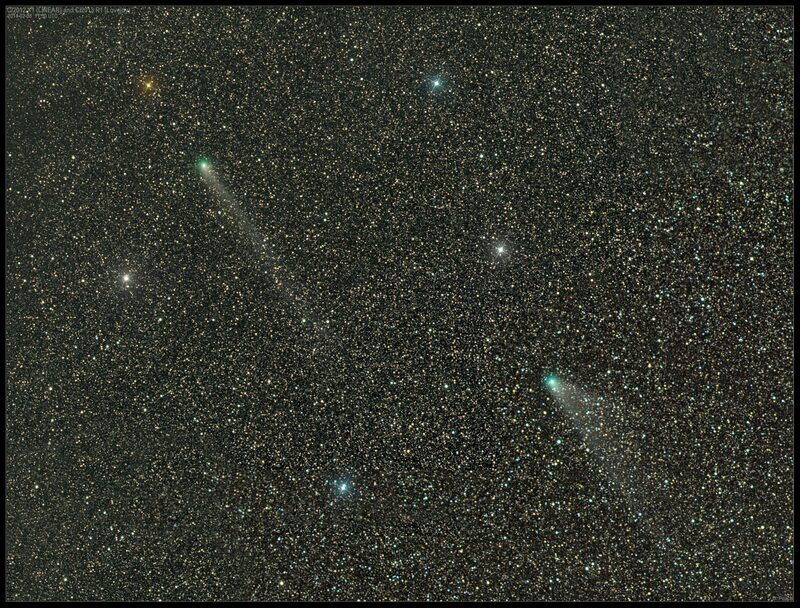 See this earlier article for more information on both comets.